"God, are you there?" is a near universal cry of the human heart. We have all longed for God to be tangible. Some might sway to worship music, others go on missions, others fast from food. The universal quest is to feel the divine . . . and yet the divine seems aloof, even shy. In this narrative-driven book, Tony Kriz leads the reader on a journey of "orchestrated epiphanies" along the eternal quest to tangibly encounter God, including the unpredictable moments that give us hope, and even more so, the long gaps between those moments that challenge our faith. 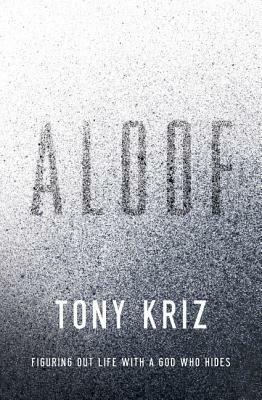 Written in an authentic, conversational style, "Aloof" is easily accessible to those who don't know much about the Bible, yet the message is still theologically informed and culturally relevant. This book will help you process how God acts uniquely towards us, depending upon each stage of life. The chapters include contemporary real-life stories that normalize the experience of an often hidden God, while also aiding the reader to acknowledge the very real moments (rare though they may be) when God has shown up in a tangible way. Tony Kriz tackles the elephant in the room many of us have skirted around at some stage, especially in Christian company. If God is all powerful, loves us so deeply, and has proven Himself to be an apt communicator, why does He seem to hide from us most of the time? Kriz describes the futility he's grown up feeling, while other, apparently more 'super' Christians talk at length about their supernatural encounters with God, making him wonder, 'What's the problem with me then?' He even became a missionary and God still seemed to be too busy with others to bother with him. He is honest in admitting his tendency to pretend that God is closer than he actually felt Him to be; such as the time as a teen, when the pastor invited him up on stage to share the amazing insights he received on his mission trip. He describes his personal experiences. Children brought up in the Christian faith may subtly learn accepted ways of talking about God from 'religious' people. He searched for what he called the 'super faith serum' he hoped would charge up his relationship with God, following every lead he could. After hours of Bible study, prayer, retreats, outreaches, and prayers for extra blessings from mighty warriors, the magical elixir still seemed to elude him. What can you do then? Tony Kriz decided to walk away, no longer bothering to try getting close to God anymore, as it seemed to get him nowhere. Parts 2 and 3 of the book explain how he unexpectedly ended up back in God's fold. The thoughts he puts forward for us to ponder are interesting. It's clearly for the earth's own good that the sun's distance is maintained. Could it be similar with us and God? We may say we long to get closer to God, but who wants to be an Icarus, getting his wings burned? Do we really want mountain top encounters and Shekinah moments, such as people like Moses, Isaiah, Paul, Peter, James and John experienced? There were often serious repercussions for those who got up that close and personal, so maybe God is honouring our deeper selves who appreciate the distance, even though we don't know it. There are several stories about coincidental moments and times in which God came through, although He skirted the 5 senses. Altogether, it's an honest and thought-provoking read, packed with ideas to make us reconsider the way God relates to human beings. Thanks to Net Galley and Thomas Nelson for my review copy.